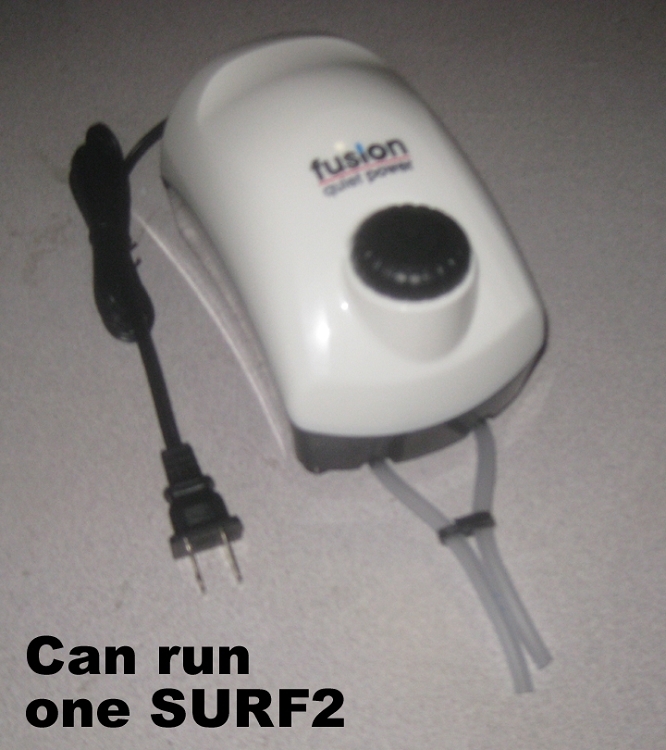 It will also work on the SURF4 and SURF4x, but you will need two of them. It is not large enough for a SURF8 or SURF8x, and for that you instead should look at the Hailea ACO9720 or similar, which we do not sell. It also works on the WAVY air filter, but you will need two of them. 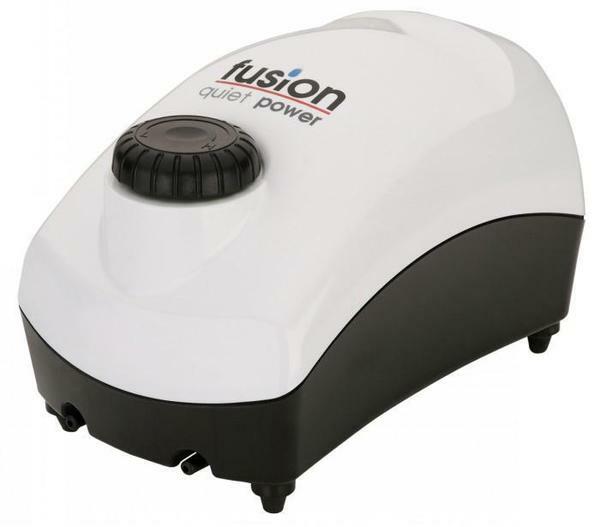 The Fusion 700 puts out about 4 lpm (liters per minute) total, which is about 2 lpm per outlet (it has two outlets), and is a very quiet pump; it is also adjustable down to a very low flow. 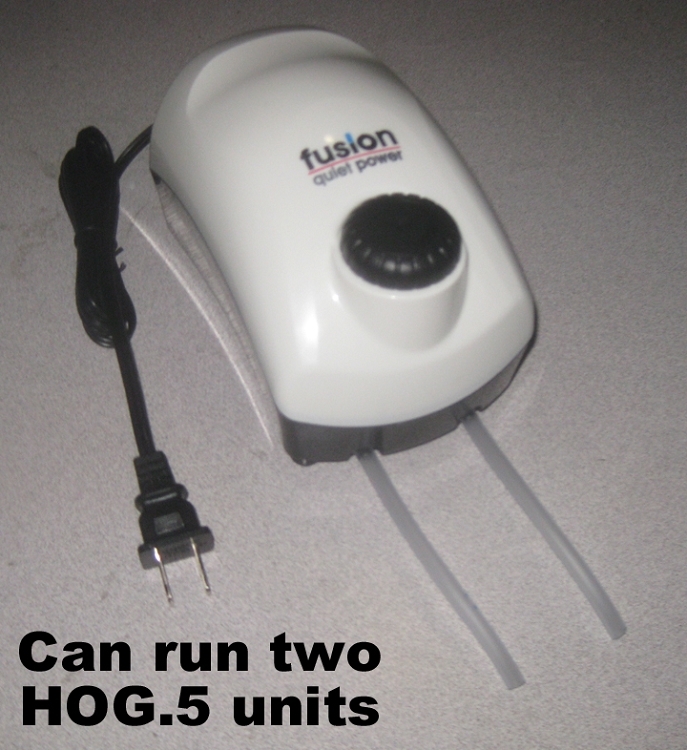 The two outlets can power one or two DROP.2 or HOG.5 or HOG1 or HOG1x units, or you can combine the two outlets into one outlet (using the included T fitting that we put in) to power one HOG1.3, HOG2, HOG3, HOG3x or HOG3xx or any of the larger DROPs. 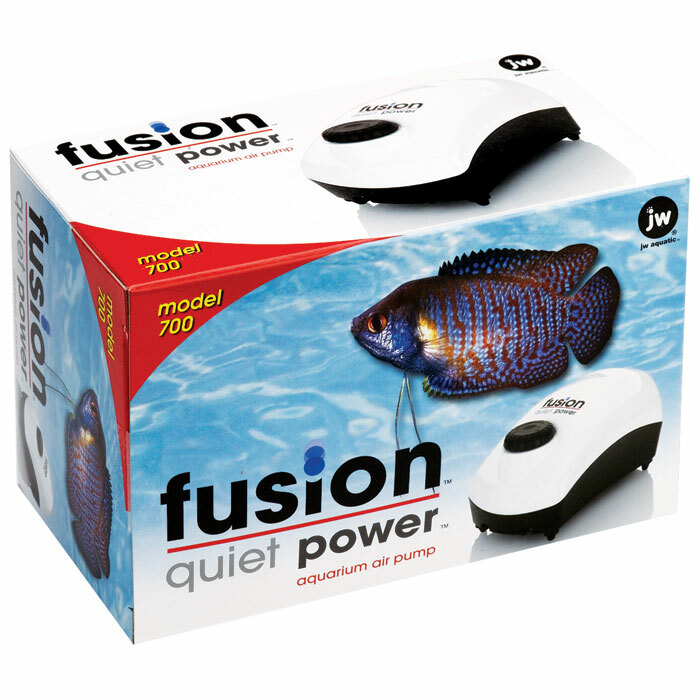 You can use the two outlets to power one SURF2, SURF2x or SURF2xx which has two air inlets. 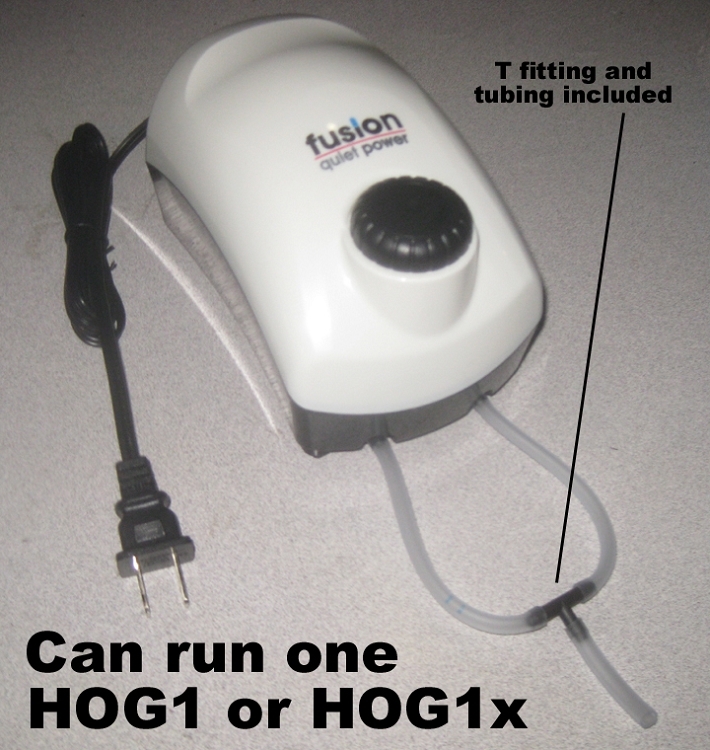 Or get two pumps to power one SURF4 or SURF4x or WAVY, which have four air inlets. 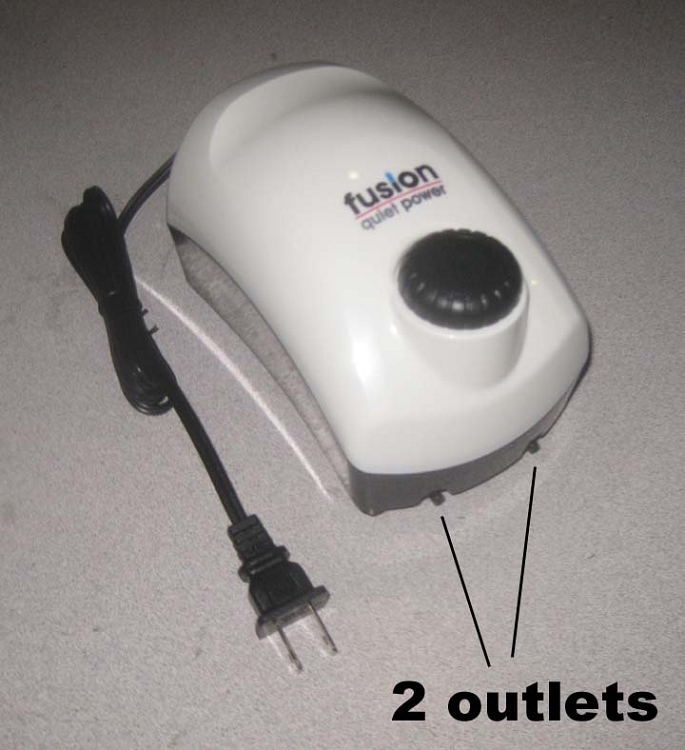 In countries that are 220 volt, you will need to get a transformer from your local electronic or home improvement store, or online. The transformer will also convert the USA plug to your local plug. Comes with the "T" fitting in the picture, which we put in ourselves because the pump does not normally include it. Also, we have added a drop of oil to the electronic control, to make it more reliable, and we also glued a plastic ring underneath the control knob to keep out water that might splash on the top of the pump. There is one better pump, the Tetra Whisper 300 which is totally silent and puts out a little more air, but it is much more expensive and is not adjustable. And if you want a single pump for the SURF4, you might try the Hailea ACO9720 which has multiple outlets, and is available in the U.S. from PentairAES. The Hailea pump is not recommended for the WAVY because that pump is not adjustable. In addition to the warranty from JW Pet, we at Santa Monica Filtration will warranty the pump for 90 days. However you must ship it to us first, before we ship a replacement to you. You will then also be refunded for shipping costs back to us.